OSTEOARTHRITIS: THIS DOESN'T MEAN THE END OF EXERCISE! Osteoarthritis, the most common form of arthritis, is the breakdown of the cartilage in the joints, which acts as a cushion between bones. As a result the bones may rub together, causing pain, swelling, and a lack of mobility in the joint. Do I have to stop exercising if I have arthritis? Arthritis can make exercise painful, but that doesn't mean you should cut out physical activity altogether. If you stop exercising you are likely to put on weight, which will in turn increase the strain on your joints. 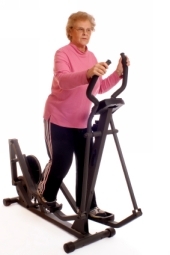 Research shows that impact exercise is crucial in the prevention of osteoporosis (brittle bone disease). Impact exercise causes synovial fluid (the lubricating oil of joints) to be produced, reducing friction and protecting cartilage from wear and tear. Also, the right type and amount of impact exercise will help to maintain the strength of the protective structures, such as ligaments and tendons, which support your joint. As explained above, impact exercises such as jogging and aerobics can help strengthen joints. However, if impact exercises are repeatedly causing you joint pain (as opposed to normal muscle ache from exercise) you should reduce the intensity of that activity, or leave it out of your fitness regime altogether. One of the most important ways to prevent wear and tear of joints is to ensure that they move properly. This requires specific strength and stabilization training. Make an appointment with a fitness professional (at your gym if you are a member of one) who is part of REP (the Register of Exercise Professionals) and explain you want to improve the stability of your core and joints to prevent osteoarthritis flare up. Incorporate some non-impact fitness classes into your weekly exercise plan to continue burning calories whilst giving your joints a rest. Yoga is also a good class for improving flexibility and relaxation. Your body is the best judge of what is good for it and what's not. Respect it by resting if you experience pain, and remember that high-impact cardio training isn't the only way to lose weight. Having arthritis doesn't mean you have to stop exercising; it just means you have to adapt how you exercise!